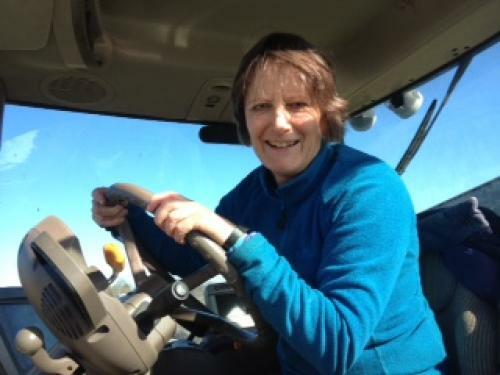 Christy Willett has been welcoming local primary school children to her arable farm near Chelmsford in Essex for many years but now also hosts visits for inner city London schools through the Country Trust. Christy grows wheat for Marriage's, Master Millers in Chelmsford and as well as walking the fields to look at and discuss wheat and barley growing, minimum tillage, the importance of biodiversity, and to listen to the sounds of the farm and the countryside, children see the mighty combine harvester and go into the grain store and try their hand at grinding corn into flour. Christy usually has a selection of food products containing wheat and malt (Maltesers always a hit!) for the children to try too. Christy says "It is hugely rewarding welcoming children to our farm to be touched by their raw energy and zest for life. There's nothing better than watching the light bulb moment when a child connects something we are doing to their food. For example, the simple action of a child using a hand mill to grind wheat into flour. We take our surroundings for granted most of the time. It is a solitary way of life much of the time. When children visit we are reminded of the importance of the countryside and often reflect that our work with schools is some of the best work we do."